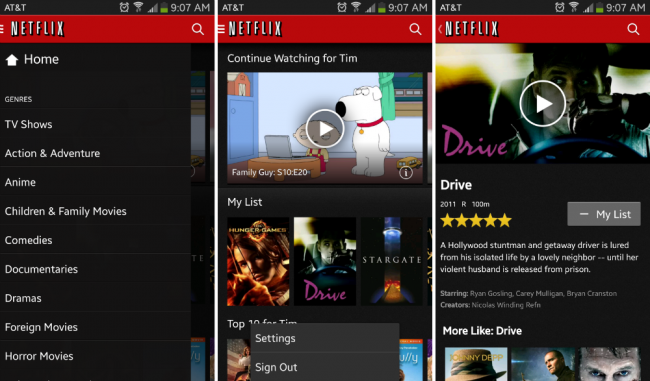 Thank goodness, the Netflix team is starting to push out a completely updated Android app. Version 3.0 is starting to leak through the cracks, and it is a good update for anyone who has been frustrated over the current version’s icky performance. As of right now, the Netflix app stutters all over the place, having a hard time even scrolling through the endless lists of available content. It’s a poor experience, but 3.0 should fix that right up. With the newest version, which should be live for everyone on Google Play sometime soon, a completely new slide-out navigation bar has been added, as well as an action bar for access to Settings and logging out. The entire app looks sharper than the previous version, and the playback experience has also received a boost. For any Chromecast users, don’t worry, that function is still alive and well. If you start seeing it rolled out, let us all know.